It was a historical day for the people in Neotan village as they celebrated the first ever Holy Mass in Mossang dialect on the annual celebration of harvest festival on 12th September 2015. Neotan village in Changlang District of Arunachal Pradesh is famous for many reasons. This is the only village in Arunachal Pradesh with cent percentage literacy rate. This is also the biggest Catholic village in Changlang District. Hon’ble Minister for Water Resource Department, Food and Civil Supplies and Geology and Mining, Govt. of Arunachal Pradesh, Mr. Kamlung Mossang also hails from this village. The introduction of Holy Mass in Mossang Language today during the annual harvest festival makes this village even more special. 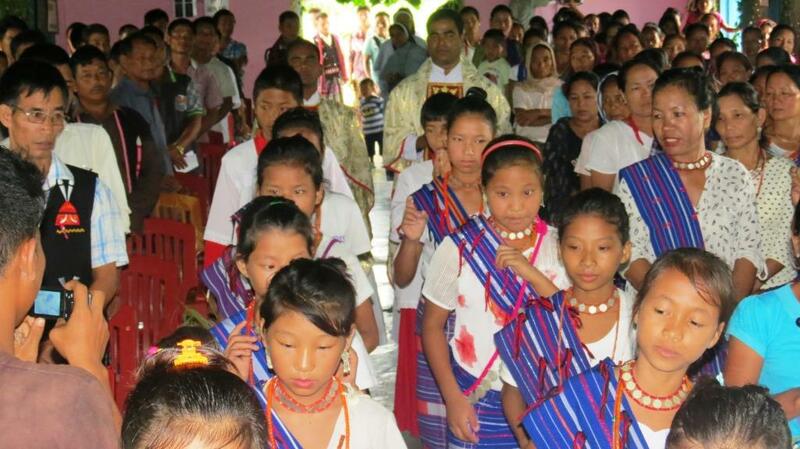 The translation of the Liturgy from English to Mossang, a prominent Tangsa Tribe of Arunachal Pradesh, was in progress for the last few years. Mr. Wanglung Mossang, who did the translation work, said he was very happy that his hardwork of the last few years came to fulfillment. Wearing the traditional attire, all the villagers were beaming with joy as they participated in the first ever Holy Mass in Mossang today. Mr. Nongkhum Mossang, the village leader said that he was very happy to witness a Holy Mass in his own language. Fr. Felix Anthony, celebrating the Mass in Mossang language, thanked Mr. Wanglung Mossang and his collaborators for their hard work to make this day see the light. “It is very relevant that we have this Mass in our own language on the Harvest Festival. Our children are forgetting our own dialect. Having our prayers and mass in Mossang will help our younger generations not to forget their mother tongue”, he said.